A delicious, quick and easy meal, ideal for days when you don't have much time to make up a fresh meal for your ratties. Also popular for rats who need a little extra or have trouble eating dry food*. 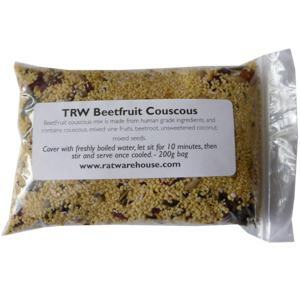 BeetFruit couscous mix is made from human grade ingredients, and contains couscous, mixed vine fruits, beetroot powder or slices (varies on ingredient availability), unsweetened coconut, mixed seeds. Easy to prepare, just place a spoonful or two in a dish, cover with freshly boiled water, let sit for 10 minutes then serve when it is cool enough. This particular blend will turn a lovely shade of deep pink when you add water! If you're going on holiday, bring some along to your ratsitter's to make their life easier without depriving your rats of their tasty fresh meals! * When feeding soft food mixes instead of a dry diet, unless you are feeding the Rat and Mouse Maintenance ground diet, please make sure that your rats get a complete supplement daily.